Boarding pass, identification, credit card and / or cash: Without these items you may not even make it on board! Cell Phone and other electronics: Ha ha! Does anyone ever separate themselves from their phones…ever? That’s how I feel about my Kindle, too. Prescription medication: It’s so critical to have access to your meds. There’s no guarantee your bags will arrive in time for your next scheduled dose, or that they will arrive at all. Eye Glasses: I carry both prescription readers and prescription sun glasses. Hubby keeps his contact lens solution on him too. Makeup, hair brush and tooth brush: I can’t risk not having these items with me. 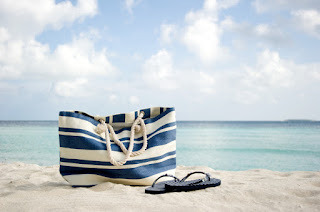 Swim Essentials: I always pack my swimsuit, flip flops and sunscreen so I can jump start my tan. It may be the only time all week where I have my choice of lounging anywhere I want! The pools will be empty enough to swim laps and the hot tubs will often be deserted for those first few hours. I also pack a large plastic bag in case I want to change out of a wet suit. Change of Clothes: Even though it’s perfectly acceptable to go to dinner on the first evening in your travel clothes, I prefer not to. A cute t-shirt dress rolls up nicely, weighs nothing and fits in my carry on tote. Jewelry: I don’t travel with good jewelry, but it’s worth mentioning for those that do.